I was curious about this mystical pink pot as soon as I spotted it in Boots nestled at the bottom of the Bourjois display. A few visits later curiosity got the better of me and I took a closer look. 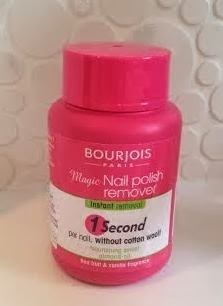 It is a nail polish remover which claims to remove your nail polish in just one second with minimum effort. Inside the pot is a sponge saturated with polish remover. 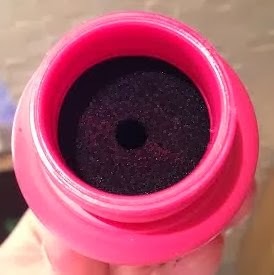 You put you finger into the hole in the middle of the sponge and twist, and the combo of chemicals and friction should take the polish right off. At £4.99 it is pretty pricey for a nail polish remover compared to my usual Sally Hansen remover at less than £2. So I was good and resisted for a while, but eventually caved in last week during one of the 3 for 2 offers in Boots. 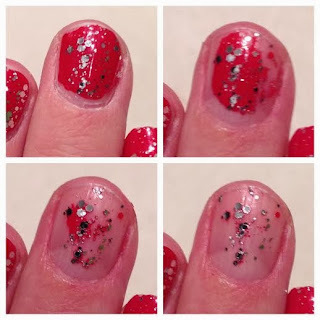 In my recent Christmas Nails post I used a chunky glitter polish - now on day 5 it was starting to chip and look a bit shabby. So I thought I would set the Bourjois Magic Polish Remover to the test. You can see from the rather grizzly looking pictures above that the Magic Nail Polish Remover did a pretty good job, apart from on the chunky glitter pieces. I treated each 'swipe' as a good wriggle around in each direction, but less challenging polish wouldn't need as much. So in the end I had to cave in and go back to my old faithful Sally Hansen remover to get rid of the dregs. But I don't consider this a failure for the Bourjois Magic Nail Polish Remover, it certainly did the bulk of the job. I do have a couple of doubts though - I don't know what happens to all of the gunk that comes off of your nails, and I wonder how long it will last before it dries out. I will keep it for removing normal colour polish rather than texture or glitter. Plus it will be amazing for those quick fixes when you scuff a nail and need to remove and repaint, without risking soaking your other perfectly painted nails with remover - we've all done it. Now if only they made one for toes so you can redo your toenails without taking your fingernail polish off in the process! 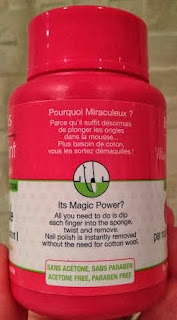 Bourjois Magic Nail Polish Remover is available at Boots for £4.99 for 75ml.